"It's such a beautiful day, I think I'll go shopping for a Collision repair shop!" Let's be honest. This will never happen. People don't wake up and go looking for a body shop in their local area. Have you truly looked at how customers find your business? Based on millions of consumer experiences we have measured at UpdatePromise we know that 95% of a local body shop or even a national collision repair center's business, comes from one of three sources. Companies such as Forbes boast that approximately 90% of todays consumers read online reviews, and 88% of them trust what they read in those reviews. In an article titled The Power Of Review Sites For Brands Forbes continues to state that 40% of those customers will make a decision based on as few as one to three opinions. So what does this all mean for your local body shop? 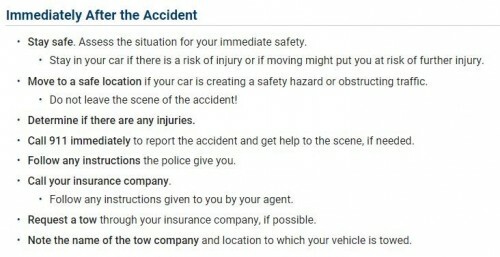 The Department of Motor Vehicles lists "Call Your Insurance Company" as the 6th most important thing to do after an accident. If you connect the dots, a customer will call their insurance company, have 2 to 3 collision repair centers recommended to them, and will then look up those centers BY NAME to verify the referral and make a decision. How do you capitalize on this? You must own as much real estate on the first page and top rankings of major search engines to ensure that customers being referred to your location find ONLY Verified Customers Real Reviews from your business. 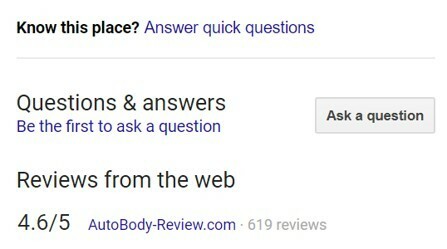 Sites powered by UpdatePromise technology, such as AutoBody-Review.com and even your own social media and website (when connected to your AutoBody-Review.com site) are perfectly positioned to ensure that your referred customers see your Verified Customer Reviews. Check out our Top 5 Critical Items to look for in a Review site when making your decisions. But all in all, don't spend money on "Best Body Shop in..." focus your efforts where your customers are. Try our search bar above to see real world examples of Verified Customer's Real Reviews from our local Body Shops.